Koror/Munich, February 02, 2017 – The Secret Season is the perfect time to discover some well-protected wrecks and macro dive sites and enjoy dives off the beaten path. For many years, the best time for diving in Palau has been promoted to be between November and May. This still holds true for the exposed outer reefs, home of pelagic species and sharks. With climate change, weather conditions have become much more unpredictable and even in the summer and early autumn months, the diving conditions can be perfect at most of Palau’s iconic dive spots. Regardless, many of the wrecks are located in the inner lagoons, closer to the city of Koror, and protected from wind and high waves, thus remaining a haven for divers. During the “Secret Season” from August through October, Sam’s Tours will be offering a weekly package that combines wreck and macro dives in the protected area of the Rock Islands combines wreck and macro dives and a leisurely kayak tour through the inner lagoons, nurseries for many reef fish and sharks in a pristine environment. In-depth presentations and detailed briefings on the wrecks’ history and their fate during World War II will add to a better understanding of the dive sites and provide avoid underwater photographers with valuable tips on how to capture each wreck on lens. Historic photos complement the briefing sessions, turning each briefing into a history lesson. The largest shipwreck in Micronesia is the deepest Japanese wreck in Palau. The 10.000 ton oil tanker sank during Operation Desecrate One on March 30-31, 1944, and was partially salvaged after the war in 1950. 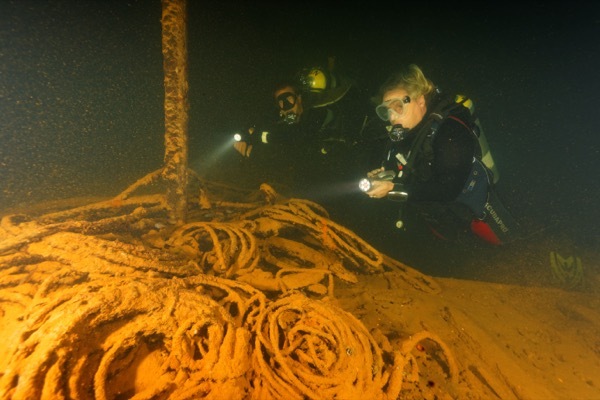 Among the artefacts to be discovered are pipes, hoses and large valves used for loading and unloading the oils and fuels wich are visible near the bridge. The deck below the wheelhouse contains radio equipment, wiring, light fixtures, and electrical panels. Twisted remains of a circular gun platform at the stern are a silent witness of the transformation of the ship to serve war duties. The medium-sized Japanese coastal freighter was bombed during Operation Desecrate One on March 31, 1944. After another hit, the ship sank on April 1, 1944 and now rests upright on the bottom of the sea. The Chuyo Maru is abundant with marine life, such as juvenile harlequin sweetlips, six-banded angelfish, white pyramid angelfish, skunk clownfish, and large varieties of tropical fish and shrimps. The bridge still contains remains of the brass compass and ship’s telegraph. The Japanese Navy Oiler is an old-fashioned fleet supply vessel and was damaged by a US submarine torpedo attack on its way from the Philippines to Palau. The bow displays a large crescent where the torpedo hit. The ship sank on March 31, 1944, during Operation Desecrate One. Besides offering an interesting marine life, the wreck is famous for its rich coral formations of staghorn, brain and lettuce corals surrounding the ship. Inside the ship, oil drums and machinery in holds make great photo opportunities. The medium-sized Japanese cargo freighter is a sister ship to the Teshio Maru and Raizan Maru, which also sank in Palau. The Ryuko Maru, only built in 1942, was burnt in Truk Lagoon in February 1944 and then sailed to Palau the following March. Here, she was sunk in the air raids of March 30-31, 1944. Its machine gun lies on the floor of the bridge in four inches of silt, and bombs can be found in the shallow waters around the ship. Today, the wreck is home to octopi, damsels, blue-green chromis and many varieties of invertebrates. This cave system is made up of five separate, connecting chambers with air pockets. Over the millenniums, rainwater, percolating down through the limestone, eroded the interior of the islands, forming vast cave systems. While Chandelier Cave was once an open-air cave, stalactites and stalagmites slowly grew into formations resembling glittering chandeliers. After the last ice age, water levels slowly rose, completely concealing the cave’s entrance. A halocline inside the cave, mixing salt and freshwater, creates a layered effect. The popular dock dive right off the dive centre is famous for its resident colony of colourful mandarin fish, which are often spotted mating at twilight. During daytime, this dive site provides an amazing variety of butterfly fish and macro life that the well-trained dive guides of Sam’s Tours love to point out to divers. Rates start from US$1.340 per person and include seven nights’ accommodation, four days of diving with Sam’s Tours, a kayak tour, including all transfers and lunches on activity days. For buddy teams, the second diver enjoys a 35% discount off the diving.